Most kidney transplant centers in the United States utilize induction agents as part of their immunosupression protocols. The reasoning behind is that induction therapy has been shown to reduce the rate of acute rejection, however no trial has yet demonstrated an improvement in long-term graft survival. Induction therapy has also expanded in centers using steroid-withdrawal protocols and in patients with expected delayed graft function due to prolong ischemia time (ECD/DCD kidneys), since calcineurin inhibitor initiation may be delayed (significant vasoconstriction from CNI may potentially delay recovery). rabbits with a cell suspension of human thymic tissue (thymocytes). After immunization, the serum is harvested from rabbits and immunoglobulins against thymocytes are isolated and subjected to a number of purification processes. Samples from more than 26,000 immunized rabbits are pooled to achieve a high level of batch-to-batch consistency! Our center uses ATG for induction in high immunological risk patients and Basiliximab for low risk patients in combination with tacrolimus and MMF for maintenance. Steroid withdrawal is performed on most patients by the end of first week post-transplantation, with the exception of highly sensitized patients. Below a summary table of the 3 most common induction agents in clinical use today, their target cells, dose, cost and side effects. Diuretics vs. Ultrafiltration: Isn’t the debate settled yet? We have all been called in to see patients who have developed AKI after receiving mechanical ultrafiltration (UF) for acute decompensated heart failure (ADHF). In almost all situations I have experienced, UF was started early, perhaps without optimization of diuretic therapy. The UF program at our institution is run by the Cardiology service. In spite of the weight of the current evidence, I have seen a distinct specialty specific bias towards UF (Cardiology), and against UF (Nephrology). After I received the nth consult for AKI in the above setting, I decided to review some evidence for a cardiologist friend. I thought it’ll make for a review of a pertinent situation that we all will continue to face. In brief, three major randomized trials have compared UF against diuretics in ADHF, over the last eight years. The first one was the RAPID-CHF trial. The primary end point was weight loss at 24 hours. A larger trial was published in 2007, the UNLOAD trial. Both these trials showed a greater rate of fluid loss with UF than diuretic use. The UNLOAD trial also showed fewer rehospitalizations at 90 days, for the UF group. From a renal perspective, there was no significant increase in creatinine with UF reported in either trial. The results from the above two trials really made UF almost a “first line” treatment for ADHF. On top of it all, I saw data from a study in Italy increasingly (and perhaps, erroneously) getting extrapolated to UF use for treatment of ADHF. Essentially, the Italian study had shown that intermittent hemodiafiltration could increase diuretic responsiveness and reduce the level of inflammatory cytokines. Equating hemodiafiltration to ultrafiltration would make me cringe as I struggled to explain the difference to my cardiology colleagues! Finally, we had the CARRESS-HF trial late last year which tried to answer the same question in a slightly different way (stepped algorithm for dosing diuretics vs UF). At 96 hours, there was no significant difference in weight loss between the two groups. The primary end point of increase in serum creatinine was significantly worse in the UF group. The UF group also showed a significantly higher rate of other serious adverse events (eg, bleeding, anemia, thrombocytopenia, dyselectrolytemia, sepsis, heart failure). There also was a trend towards higher mortality for patients who received UF. Given the relatively recent nature of the evidence against UF, it might be some time before we see a universal change in clinical practice. So I guess we nephrologists will continue to see patients of refractory ADHF with AKI, where perhaps diuretics weren’t used in a stepped fashion, or UF was used early. At this time, the American College of Cardiology recommends that UF be used only as a second line treatment for patients who do not respond to diuretic optimization. I am curious to know what your experience has been in this setting? 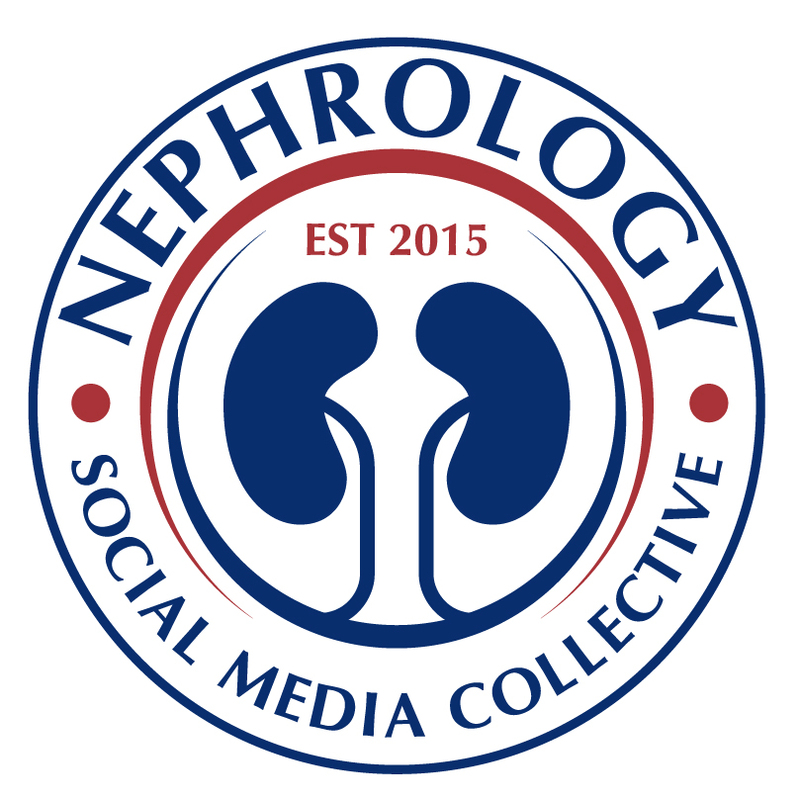 Have you experienced a difference of opinion between nephrologists and cardiologists? In my experience the appetite to biopsy patients with clinical renal disease varies widely between clinician, institution and country. This is most apparent when it comes to the diabetic patient with renal disease. In my opinion there is a fear among nephrologists of biopsying patients with potential diabetic nephropathy (DN). Of course there are clinical features that increase the likelihood that a diabetic with renal disease has DN. Retinopathy in a type 1 diabetic, longstanding DM and progressive proteinuria over years preceding an elevated creatinine. However, the role of microalbuminuria and proteinuria in predicting CKD progression and the traditional course of rising albuminuria in DM1 has been challenged. In DM type 2 the picture is less clear and these patients frequently have many comorbidities. Gearoid posted on this subject about a year ago now. In CJASN (October) Sharma et al from Columbia University reviewed the characteristics and renal diagnoses in 620 diabetics who had a renal biopsy. Over 90% had type 2 diabetes. In Columbia in 2011 approximately ¼ of all biopsies were on patients with diabetes. The results of this retrospecive review were that 37% of patients had DN alone, 36% had non-diabetic renal disease (NDRD) alone, and 27% had DN plus NDRD. In NDRD alone: FSGS (22%), hypertensive nephrosclerosis (18%), acute tubular necrosis (ATN) (17%), IgA nephropathy (11%), membranous GN (8%), and pauci-immune GN (7%) comprised 80% of diagnoses. 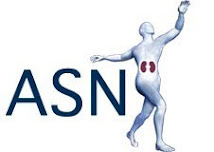 In DN plus NDRD: ATN (43%), hypertensive nephrosclerosis (19%), FSGS (13%), and IgA nephropathy (7%). In multivariate analysis longer duration of DM was associated with a greater likelihood of DN and less likelihood of NDRD. The table illustrates the features of patients at the time of biopsy. Older age, having DM2 vs DM1, short duration of DM and less proteinuria are more likely in those with NDRD alone vs DN alone in this cohort. I think this study highlights the importance of considering biopsy in diabetics (especially type 2). I would be interested to hear about the experience of others with respect to biopsy in diabetics. Labels: Andrew Malone, diabetes mellitus, Renal Biopsy. There have been a number of studies reported in the past month which broaden our understanding of the complexity of alloantibodies post kidney transplant. It is well recognized that the presence of donor specific anti-HLA antibodies (DSA) infers a worse allograft prognosis, both in terms of early antibody mediated rejection (AMR) and graft survival. It is also becoming clear, from groups such as the DeKAF study investigators, that most causes of late graft failure are due to chronic AMR. Treatment options for this entity are unfortunately dismal at present. Our current understanding of immunological risk is somewhat simple and DSA alone do not fully explain a patients’ risk of AMR events. AMR can occur without DSA, presumably due to non-HLA antibodies (see NEJM MICA antibodies paper). Moreover, the presence of DSA alone does not necessarily associate with immunological injury. Recent studies help with our understanding of these important points. Two reports in the current edition of American Journal of Transplantation identify antibodies against Angiotensin II type-1 receptor (Anti-AT1R), with AMR and allograft failure. Anti-AT1R have previously been associated with AMR and polymorphisms in AT1R have been associated with steroid resistant acute rejection. In the first AJT study, 351 consecutive kidney recipients had sera tested for anti-AT1R. In patients with abnormal biopsies/acute rejection, the rate of anti-AT1R was significantly higher than the control group (18% vs. 6%, p < 0.001). What is novel however is the survival data; with 79% of abnormal biopsy patients with anti-AT1R losing their grafts (vs. 0% in control group). Patients with both anti-AT1R and DSA had lower graft survival than those with DSA alone. In a multi-factorial model, de novo anti-AT1R was an independent predictor of graft failure. A second report included 599 kidney recipients and determined a cut-off of anti-AT1R >10 U, with individuals above this level having 2.6-fold higher risk of graft failure from 3 years onwards (p = 0.0005) and a 1.9-fold higher risk of experiencing an acute rejection episode in the first 4 months (p = 0.0393). Notably, AMR only accounted for one third of all acute rejection cases. What makes some DSA pathogenic and others not? Does the complement-binding capacity of anti-HLA antibodies play a role in their capacity to cause immunological injury? This question was partially addressed in this French NEJM study of 1016 kidney transplant recipients. Complement-fixing DSA (tested for the presence of C1q-binding by single-antigen bead assays) were associated with more C4 deposition, more AMR and worse allograft survival (54% V 93% 5 year survival). Interestingly, patients with no DSA and those with non-complement binding DSA had similar 5 year survivals. Overall, these studies certainly add to our understanding of post-transplant allo-antibody but additional work needs to be done before they become clinically useful and exact indications for the tests remain unclear. Certainly in the case of Anti-AT1R, the increased risk of allograft failure needs to be clarified. Is it truly independent from Anti-HLA antibodies? Regarding Anti-HLA antibodies, it is likely that the pathogenicity of DSA is more nuanced than just their ability to fix complement. However, these studies are beginning to explain some of our unanswered questions regarding sensitization, alloantibody and post-transplant risk. IgG4 related kidney disease: A new disease or an old disease raising its head? I recently managed an elderly African American man who was admitted from the clinic for a renal biopsy. He was referred for proteinuria that had not been quantified by his PCP but had been present for over a decade. His creatinine had risen to 6.8mg/dl from 1.3mg/dl 8 months prior to referral. His admission UA had no casts, 1 rbc/hpf, 10 wbc/hpf and he had 1.2 g/24hr of proteinuria. This patient was well with no recent medication changes, NSAID use or allergies. He was normotensive and had no rash, organomegaly or lymphadenopathy. Work up was remarkable for slightly positive ANA (1:40), an amylase of 140U/l and elevated total IgG of 3000mg/dl. He also had elevated white cells with 79% lymphocytes. His renal ultrasound was normal. Hepatitis serology, HIV, complement and SPEP were all normal. He had a renal biopsy and a bone marrow biopsy. Biopsy findings. In panel A (immunoperoxidase stain for IgG4), numerous immunoreactive cells are present (arrowhead). 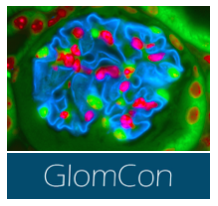 There is also mild, patchy background staining, not seen in a serial negative control section (panel B); this may reflect the presence of interstitial IgG4 secreted by the infiltrating plasma cells. The plasma cells are also seen in sections stained for CD138 (panel C) and with hematoxylin and eosin (panel D)(arrowheads). In panel C, there is also staining for CD138 in the epithelium of proximal tubules (T), which are known to express the antigen. This patient was diagnosed with IgG4-Tubulointerstial Nephritis and also with CLL after his bone marrow biopsy. He was treated with 60mg of prednisone for his IgG4-TIN and his creatinine improved to 2.7mg/dl within a month. He was tapered off steroids over months and his eGFR remains at about 30ml/min/1.73m2. IgG4 related systemic disease was first described in pancreatic specimens that had been removed for suspected malignancy found on imaging. Now it is known that this inflammatory condition can affect many organs including the kidney. 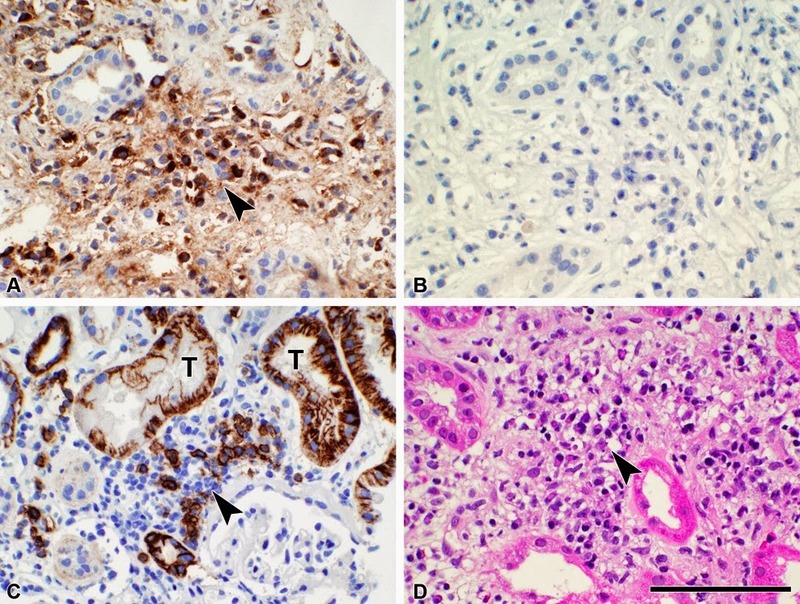 The most common renal lesion is infiltration of the interstitium with IgG4 positive plasma cells but other lesions such as membranous nephropathy can occur. Abnormal radiological findings in the kidney also occur. The full diagnostic criteria proposed by Raisson et al is shown here. In this month’s KI issue Saeki et al report on the long term follow up of 43 patients with IgG4-related kidney disease (IgG4-TIN) from Japan. Follow up data on these cases is rare. 34 patients were treated with corticosteroids and followed for at least 12 months in this study. In summary, IgG4-TIN is usually responsive to corticosteroid treatment and response is rapid but not total. If eGFR was lower than 60 before treatment renal scaring is more likely to occur. Relapse occurs in about 20% but most are responsive to further steroid treatment. Serological markers and radiological features all improve with treatment for the most part. There are no large-scale studies for this disorder that was first described with any frequency in Japan. This is a renal condition that is gaining more and more coverage in the renal literature and any budding nephrologist needs to be aware of it. 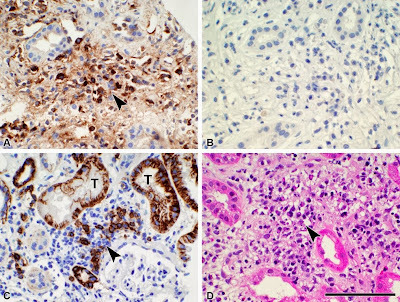 Whether this is a new disease or a disease diagnosed more frequently with the advent of better immunohistochemical stains for IgG4 is unknown. My feeling is that it is the latter. The end of the road for urinary eosinophils?